This article originally was published in the winter 1999 issue of the Peanuts Collectors Club newsletter. 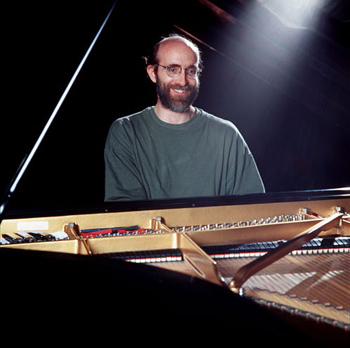 Although Windham Hill artist George Winston had been spicing his concerts with occasional Vince Guaraldi tunes for years, the comfortably laid-back pianist rarely devoted an entire evening to compositions by the man who brought jazz sensibilities to the Peanuts gang's television specials. Santa Rosa's Luther Burbank Center was host to one of the exceptions on November 28, 1998, when Winston quietly took the stage at 8 p.m. and -- allowing for a 20-minute intermission -- played nothing but Guaraldi compositions for the next three hours. Although at the time best known for his seasonal albums (Summer, Autumn, Winter Into Spring and others) and a particularly haunting soundtrack behind Meryl Streep's narration of The Velveteen Rabbit, Winston made no secret of his enthusiastic admiration for the late Guaraldi's music. Indeed, Winston waved a few sheets of paper while seated at his piano and spoke happily about having just increased his collection of Guaraldi compositions and "fragments" to 57...through judicious listening to brief music cues from the 15 Peanuts television specials and one feature film that Guaraldi completed before his death in 1976. Nor has Winston confined his devotion to intense study and infrequent live appearances; as readers of this newsletter know quite well, in 1988 he scored one of the segments -- The Birth of the Constitution -- of the eight-part Peanuts miniseries, This is America, Charlie Brown. Winston commented on this, during his Santa Rosa appearance, and it was easy to see the sense of wonder he still retained, all these years later, as he reflected on the chain of events that had allowed a young fan -- whose life had changed upon first hearing Guaraldi's work in A Charlie Brown Christmas, when it debuted in 1965 -- to blossom into an industry professional selected to participate in the franchise two decades later. 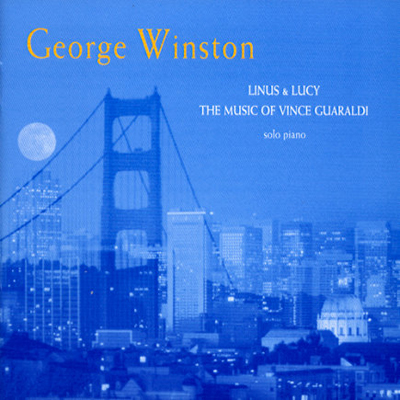 Better still, in 1996 the Windham Hill artist released Linus and Lucy: The Music of Vince Guaraldi, a solo piano album that became something of a template for the Santa Rosa performance. But even those who've played Winston's CD countless times -- a category into which I fall -- had to acknowledge the pianist's different approaches to some of those same pieces. Winston treats these compositions like living entities: They constantly evolve, as he brings his own sensibilities to pieces while retaining the "signature" that makes them uniquely Guaraldian. Winston played 29 compositions that evening: some familiar, others expanded from cues lasting no more than 40 seconds. Not all were from Peanuts specials; Guaraldi also achieved considerable notoriety, in the 1960s and early '70s, for his jazz-hued anthems to numerous San Francisco Bay Area locales. Main theme, Be My Valentine, Charlie Brown (also known as "The Heartburn Waltz"
"Santa Rosa Aloha" (Winston's title for an expanded fragment that he selected as his encore). The entire program was lively and engaging, and somewhat at odds with the Luther Burbank Center's conservative, church-like atmosphere; it was rather difficult to avoid snapping fingers and tapping toes. After all, this is the music that Snoopy frequently dances to, and it was hard not to follow suit. Many of that evening's audience members seemed more than a little bit puzzled by the up-tempo melodies being played by a laid-back guy who performed in socks, minus shoes (a familiar Winston trademark). No doubt such folks would have preferred to hear Schroeder play Beethoven and Brahms. First-half highlights included the delightful, honky-tonk rendition of "You're in Love, Charlie Brown," and the bouncy "Treat Street," which Winston explained blended his interpretation of "Guaraldi's right hand with James Booker's left hand." Midway through intermission, the increased buzz throughout the audience indicated that people finally had registered the presence of Charles and Jeannie Schulz. But they were by no means the only celebrities on hand; the row directly in front of ours was filled with members of the Guaraldi clan: Vince's mother, who more than once seemed quite moved by what she was hearing; and Vince's son, Dave, and his wife and son. All were part of the small group that joined Winston backstage, following the concert, when the pianist spent half an hour chatting with friends and his special guests. If he had any concerns about the music that he had just performed, they must have been assuaged by the heartfelt approval he received from Guaraldi's family. In the "you heard it here first" category, Winston spoke more than once of his intention to record a second album of Guaraldi compositions. This is not likely to happen quickly; Winston waited the better part of a decade to release the first one. But it's nice to know that somebody with Winston's clout has undertaken an archival project of this scope; the appreciation of Peanuts fans notwithstanding, Vince Guaraldi still hasn't received the mainstream recognition that he has deserved for 30 years. With somebody as dedicated, talented and respected as George Winston to carry the torch, I have to believe that it won't always be that way.